As I have mentioned before, our school is ditching SMART Notebook from September. But since that decision was made, we discovered a cool new feature in the iOS version of Keynote. The feature is officially called ‘highlighter’, which basically adds the ability to write with your finger when you are presenting mode. There has always been a laser pointer when you tap and hold, but now a set of coloured pens appear as well. You choose the colour you want and can then write where you wish. Instead of swiping between slides, you now get some arrow buttons on the left and right of the screen to change slide. All of you annotations stay even if you change slide, but they disappear when the slideshow ends. 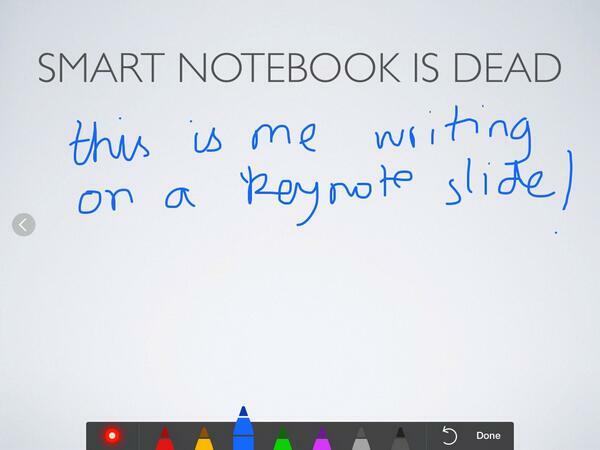 The particularly cool thing about this is that there is now another alternative to Notebook on iPad if all you want is slides and the ability to write on them. The other cool thing is that, because of iWork file compatibility, you can make your Keynote slides on your Mac (or even on iCloud on a PC) and then use them for teaching on your iPad. This is good for those teachers who don’t feel they will be as fast making slides on ExplainEverything because they have to be created on the iPad itself. (I personally don’t think it’s any slower, but I guess it makes the transition easier.) And with iCloud, the slides should ‘just’ be there (in theory! ).